I like it because its very lady like and I know it will last a lifetime. Select this simply stunning timepiece for the perfect marriage of functionality and elegance. 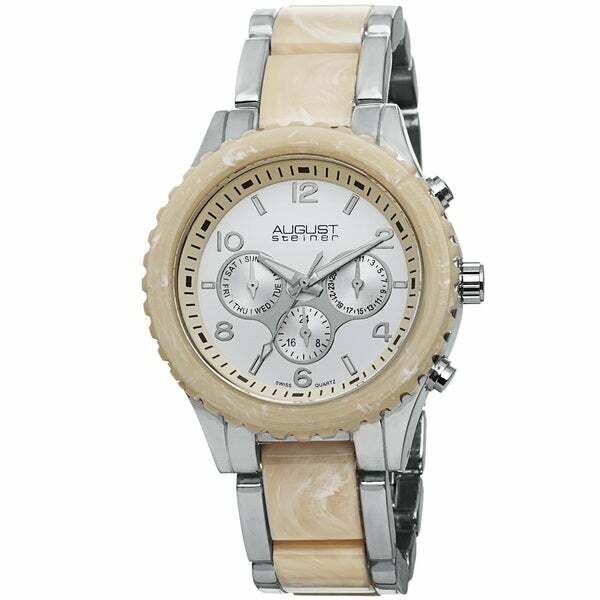 Ivory accents contrast well with the silvertone metal from which this watch is crafted. Read the bold, Arabic numerals with ease for enhanced functionality of the piece. The three-dial date display attractively and effectively communicates the current day of the week, month and date. The Swiss quartz movement promises reliable functionality. With water resistance of 33 feet, this watch can withstand the rigors of daily wear beautifully. The sizable band is adjustable from 6.5 inches to 7.5 inches, allowing you to customize your fit. I gave this as a gift to a friend and she likes it so much especially the bracelet which is one of a kind. And the price, unmatchable! The dial is a lot bigger than it looks but I'm big boned , so looks great ! If you're petite you may want to choose a smaller dial. I do love it! This is a sporty looking watch but it have the right shape and finish like a BMW car. But the wrist band is way too big and will have to have at least two and maybe 4 links out of it to fit. Also I think the date runs fast and I have to keep resetting it. A sporty look. I need to get some links removed from the bracelet for fit. Otherwise a good buy. Came within a couple of days. I have to bring it to a jewler, as it is a little big on me. A link or two will be taken out and will look FABULOUS! ! This is a beautiful watch BUT it came with no instructions on how to set it and Overstock.com did not respond to inquiry. Large face in keeping with the current style. The watch was way too large and seemed more for a man then for a women. Just not for me! The quality of the watch is like a Cracker Jack Prize. August Steiner Swiss Quartz is a nice watch to own and for the Liquidation price and the right color, I had to have it!